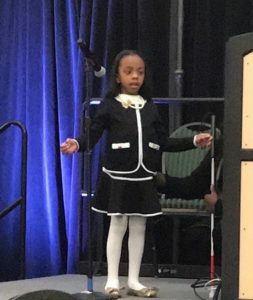 Bryant Elementary first grader Khara Gilmore received a standing ovation after reciting Maya Angelou’s “Still I Rise” during NAAPID at Night at Eastern Michigan University. 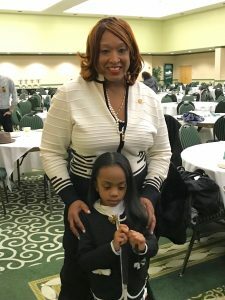 Khara, who has been blind since birth, happily accepted the assignment after she was heard reciting a small part in a Martin Luther King Jr. Day presentation by teacher assistant Dee Johnson, who was also on the NAAPID planning committee. Khara recites “Still I Rise” at the NAAPID at Night celebration Feb. 12 at Eastern Michigan University. Joseph said that she first thought Khara would like to give her MLK Day speech at the event. But she said she’d rather recite a poem. Way to go Khara! Soooo proud of you!